But all my kids are too old for YA fantasy, which is a shame: it means their father — long past the point of fretting about whether he is “too old” for anything — has all the fun. 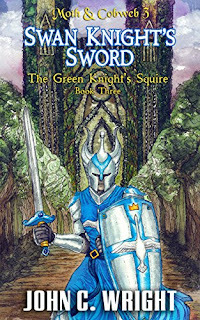 If your kids are not, and if they actually read something other than text messages and tweets, AND if they have a Kindle or the equivalent tablet or PC software, John C. Wright’s Moth & Cobweb books are a truly delightful experience; a boy-and-his-dog story with knights, elves and plenty of medieval weaponry. 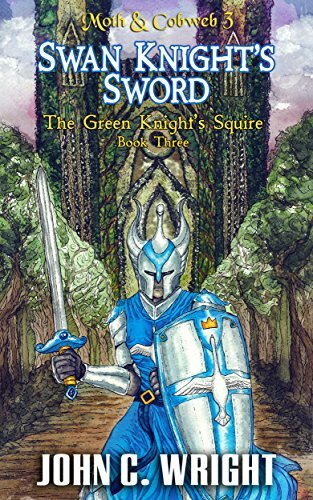 Swan Knight’s Sword is noble, sweet-spirited, fast-paced, occasionally violent … and very, VERY Catholic (if you aren’t, you may find yourself struggling to explain words like “shriven”). Still, the occasional flurry of high-church vocabulary did not diminish my enjoyment one iota, and it doesn’t hurt Protestant kids to have some familiarity with what their Catholic friends experience. Wright is big on Christian character, but he doesn’t get preachy about it. His hero is a boy well on the way to becoming a man of integrity, with all the natural and supernatural struggles that process entails. It’s a treat to read fiction in which virtues actually appear desirable rather than an impediment. The three-volume series is digital-only at present, but is expected to be available from Amazon in hardcover and paperback editions some time in 2017.